Maybe it's the recent(and very late) spring temperatures we are seeing, or maybe it's the two pinched nerves in my neck keeping me basically bed ridden but we are feeling the itch for adventure. Every spring, summer, and fall we try as often as possible to get out and learn about the wild bounty we have here in Saskatchewan. When we speak of our findings, we are often met with a couple blank stares and a few cautionary tales of death dealing funghi. Many of us were raised to believe everything that grew in the forest was poisonous, and if it wasn't poisonous, it was most certainly filthy and should never be eaten. Your parents may have been raised believing the same, or maybe they have distant memories of mushroom picking with their grandparents. Sometime in the 20th century, many North American people misplaced their personal connection with food. In this series we hope to share our method for finding that connection again. In 2010 I was doing a test shift or "stagiare"(french for free labour) in a small italian kitchen in Vancouver. The back door was kicked open and the chef came barreling through with bus tubs brimming with wild mushrooms he had picked on Vancouver island. I was tasked with cleaning them, and as I inspected each one something sparked inside me... It was love at first spore. Mushroom picking can be a little daunting to begin. As they say "All mushrooms are edible, some only once"
We went down the rabbit hole, buying up field guides and learning to make spore prints for identification. Having a knowledgable friend to guide you in your early days can help, but a person can get by with two field guides (*pro-tip: always cross reference between them) and there is A LOT of information out there on the web. The first mushroom season we take note of in this province begins June-ish... The beautiful and enigmatic Morel. Grey, blond, and green morels. If you enjoy eating mushrooms, just once in your life I urge you to eat a freshly picked, freshly cooked morel. They are incredible. They smell like a dirty gym sock(in a good way, trust me!) and taste like well aged beef. Their intricate folds catch all matter of deliciousness you can throw at them. Sautéed with butter and garlic, deglazed with a little white wine and I can eat them by the pound. Morels also grow EXTREMELY well in areas that experienced a forest fire the year prior. They also stick out like a sore thumb in a burned out post-apocalyptic wasteland. This is how we chose to hunt them. Make a few calls to the ministry of environment, search for the previous years fire information. Call again when they fuddle up sending you the maps. When the maps come, pick a fire near a highway and go in early June. Bring a GPS, a cast iron skillet, and plenty of butter. A particularly good(and dirty) day in the forest. Morels also dry and rehydrate shockingly well and as a result we have a stash in our house that would cause you to question our sanity. 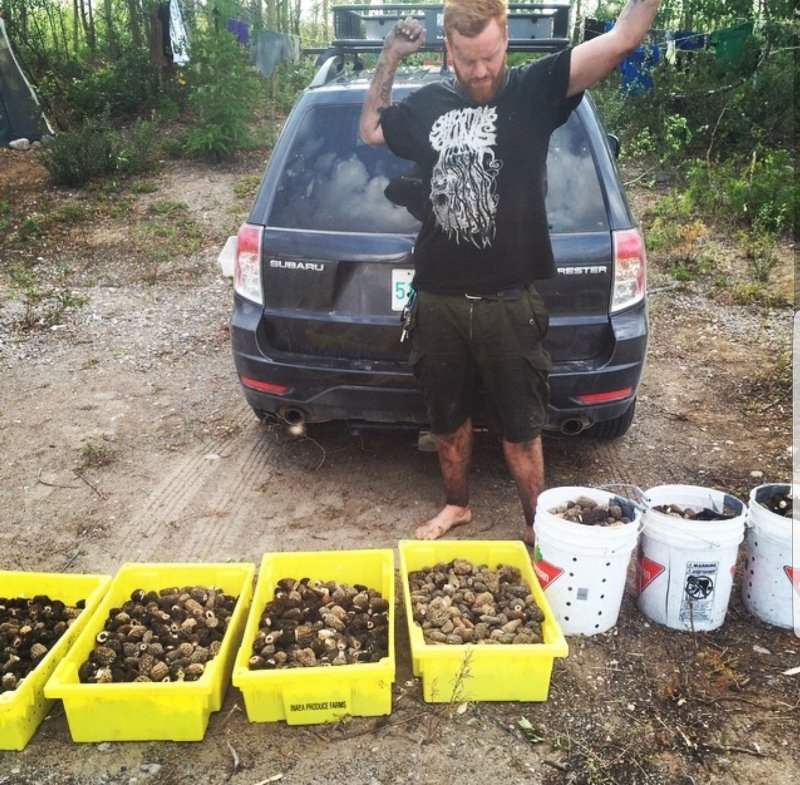 In 2015 we tried our hand at commercial mushroom picking, to varying degrees of success. Spend enough time in the mushroom woods and you may encounter a true child of the forest... This person may wax poetically on the virtues of eating psiloscybin mushrooms to "See the morels better" Speak quietly and vaguely about mushroom locations and irritatingly pick twice as many 'shrooms in half the time. Skipping forward a couple months, the next season we take part in is for chanterelles. 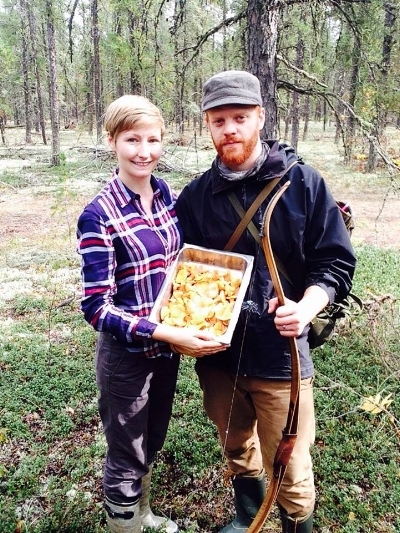 We are of the opinion that a chanterelle should be the official mushroom of Saskatchewan. There are chefs all over who covet "Sask chanty's" above all other chanterelles. They are smaller, cleaner, drier, and therefore much more flavourful than chanterelles found elsewhere. Ask anyone where they pick their chanterelles around here and all you're going to get is a half smirk and the words "up North." As an added bonus, you may come across some blue indigo mushrooms on your quest for chanterelles. They are like a peppery portabello and extremely visually striking. The act of foraging is medicine for the mind. It connects you with nature in a profound way. It wasn't that long ago in human history, relatively speaking, that foraging was an every day thing for us. Something probably as mundane as retrieving the mail. We do not pine for these simpler times, but we do feel the need to find a connection to them. Look past the GPS in my pocket, the modern clothing, and the rampant funghi related instagramming taking place and one can find that connection. A meditation on those who came before us. Happy hunting.